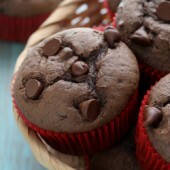 Easy and moist double chocolate muffins. A must make breakfast treat for all chocolate fans! Preheat oven to 350°F. Line a muffin pan with 12 greaseproof liners. In a large bowl or stand mixer, cream together butter and sugars until light and fluffy. Mix in one egg at a time, along with vanilla, salt, baking soda and baking powder. Scrape bowl as needed. Sift cocoa powder directly over bowl, mixing well until fully incorporated. Alternate additions of flour and sour cream until fully combined. Stir in chocolate chips. Using a large cookie scoop, divide batter between prepare muffin liners. If desired, gently press additional chocolate chips into the top of batter. Bake for 18-20 minutes or until a toothpick inserted comes out clean or with just a few moist crumbs. Cool in pan for 5 minutes or until easy to handle. Store in an airtight container for up to several days.